ARTEMIS ADVENTURES: google gets sophisticated with "street view"
google gets sophisticated with "street view"
Last night Jeff and I were online and we mapped a home on google. 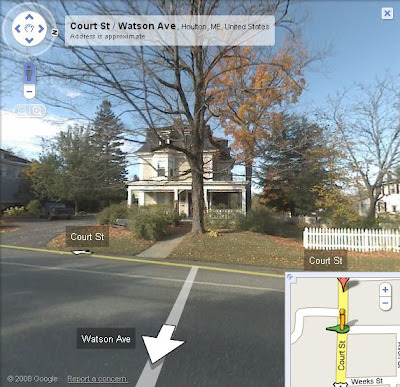 We noticed a new feature "street view" that is SO awesome!! But, yet, I also felt a little unsettled about the fact if someone knows my address they can pull up an image of my house! I don't know...it just felt weird. When we typed in our address - our house didn't immediately pop up (it was the neighbor's house down the street). We burned a little time last night looking for our family and friends homes. 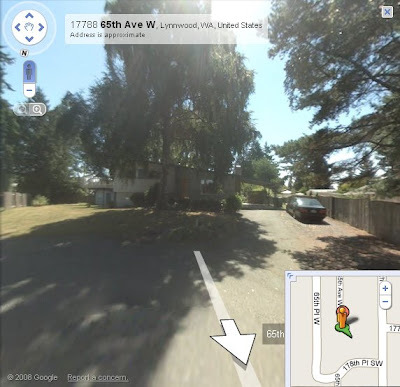 We found Jeff's childhood home in Lynnwood, too! This is very cool and I've done the same thing. You can see the back of my current house, but not the front. It is a bit spooky. I just looked at yours and I can't quite figure it out, but you may be in the front yard. I saw the vehicle that does this going down the street one day. It was a car with cameras pointing four ways. That's odd you couldn't see our house, cause we have found it before, you can see the pool and everything!